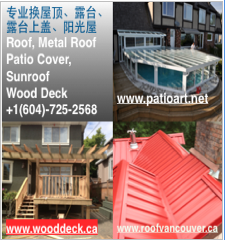 Patio Cover Vancouver - 服务行业 - 温哥华阳光 - Powered by Discuz! We install metal roof,shingle metal roof,patio cover,windows and door. GMT-4, 2019-4-25 14:29 , Processed in 0.176519 second(s), 20 queries .